When the Egyptian military took control of the Egyptian political system in February 2011, its heavy handed conduct and a series of missteps led Egyptians to ask one another: Were the generals incompetent or malevolent? That question can now be answered: They devised a political transition for Egypt that was so bad that it has led to the current crisis. They were far less an evil master sorcerer than they were a very hapless sorcerer’s apprentice. Now the same question can be asked of all of Egypt’s leading political actors: are they purposely trying to destroy the country’s democratic hopes or merely doing so by accident? My own evaluation of the actors is that the Brotherhood’s intentions are less questionable than those of their rivals. But its actions are more dangerous: good intentions may help the Islamists in the next life, but what they are doing now may damn their county to either instability or renewed autocracy in this one. Let us begin by reviewing how the generals put their civilian countrymen in such a difficult position. In 2011, the military oversaw a process that resulted in a set of interim governing procedures that were long on loopholes and short on guarantees. As the euphoria of Tahrir Square gave way to the nitty-gritty of daily politics, political actors on all sides began growing increasingly suspicious. By reserving all authority in its own hands, the military encouraged a system in which each civilian force saw its rivals as acting in an underhanded manner to persuade the military to do its bidding. Many such suspicions were justified. With elections looming, Islamists saw various leftist and liberal forces as seeking to disrupt the process and prolong military rule. And non-Islamists charged that Islamists had struck a deal with the generals to plunge the country into rounds of voting that would reward the types of strong networks that the Muslim Brotherhood, above all, already had. When a process did emerge for writing a permanent constitution it was poorly organized and weak on guarantees for minority viewpoints. The newly elected parliament was to elect 100 people who would have six months to rush out a draft—and the population would then be granted only fifteen days to discuss it before giving their approval or rejection (in a country where voters are accustomed to being expected to agree). The procedure was not only overly hasty; it was also tilted toward the Islamists, since it was clear from the beginning that religious forces would do well in parliamentary elections (though the extent of their electoral victory at the end of 2011 surprised their adversaries). The whole constitutional process seemed to be based on assumptions of trust and amity in an environment in which the short supply of both was being rapidly depleted. Most proposals to make the process more consensus were not made fully in good faith but instead were open attempts to rein in the expected Islamist victory—and were therefore rejected by the Islamists for being partisan rather than principled proposals. Over time, the country’s Muslim Brotherhood began to realize that there were two major obstacles to its being allowed to enjoy the fruits of its electoral support: an opposition that, while weak and disorganized at the polls, had articulate voices, an extensive public presence, and a real but declining ability to mobilize street supporters; and a variety of state structures—including the military, state security, and the judiciary, all holdovers from the Mubarak era—that resisted Islamist leadership and sought to retain their influence and autonomy. And both were capable of playing dirty in the Brotherhood's eyes. Islamist leaders felt they would not be able to persuade the first and began to resort to a high-handed style that alternated between dimissing and humoring them. But the state actors had to be treated more gingerly. The Brotherhood gave the military guarantees of its autonomy and special status—and it responded by ceding its dominant political role to the Islamist president elected in June 2012, Muhammand Morsi. The interior and security behemoths were left largely alone. Oddly enough, the judiciary proved the hardest nut to crack. It successfully dissolved the parliament and the first constituent assembly; a legal challenge to the second constituent assembly proceeded slowly but hung like a sword over its work. Yet even with judges, signs of a slow accommodation emerged. President Morsi appointed leading judges to top positions in the government; the constituent assembly elected as its head the retiring head of the Supreme Judicial Council. Various judicial actors lobbied vigorously for the constitutional provisions they desired and most of their demands were met. 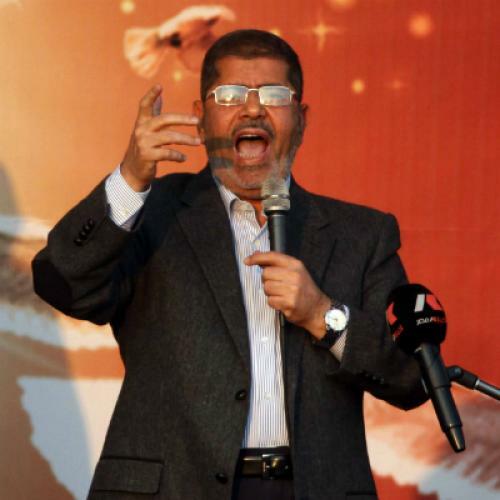 But on November 22, in what he described as a pre-emeptive strike, President Morsi issued a decree granting himself absolute authority and robbing the courts of any remaining oversight of the transition process. He claimed that the country’s Supreme Constitutional Court was poised not simply to dissolve the constituent assembly but also overturn the president’s earlier decree removing the military from its stranglehold over the country’s political system--effectively recalling the generals to power and forcing a coup. Were such fears justified? Many judges clearly weren’t fans of the Brotherhood, but the fears seem in part a product of an overheated and almost paranoid political environment. While Morsi was speaking the legal language of a dictator, his supporters’ political speech sounded (replete with claims of representing the real majority) more like something that might have emanated from deep within the Nixon White House. Even if he was provoked—or if his move was pre-emptive—Morsi’s November 22 edicts eliminated any possibility that Egyptian politics would again become consensual in the near-term. The constituent assembly has reacted to the possibility that the Constitutional Court would ignore Morsi power by deciding to pull an all-nighter to hammer out the country’s permanent governing framework. Needless to say, this is bad news for Egypt. The problems do not lie so much in the content of the constitution, which is filled more with missed opportunities than egregious authoritarianism. But that document, if it passes, will have to operate in a very difficult atmosphere. Rival camps have now formed and are preparing to face off in every arena: not merely at the polls but in the press, the courts, and and the streets. Only a continued aversion to violence and a fear that civil disorder could drag the army back are preventing more violent struggle. And all this is bad news for the Brotherhood as well: had its leaders not panicked, they probably would have received the constitution they wanted (the substantive differences among the parties on constitutional provisions are actually much narrower than one might think from the shrillness of the debate). And likely electoral victories would have allowed them to take their place at the head of a political system that was functioning and accepted as legitimate. As it is, they may win but the society will be deeply divided and an important part of the state—the judiciary—is forgetting its stodgy ways and rising up in defiance of the president. When Morsi issued his decree of November 22, I thought that the best hopes for Egyptian democracy relied on his sudden metamorphosis into an Egyptian Cincinnatus. One week later, it is clear that Egypt has hurtled too far forward in Roman history for that to be likely. Instead, all poliical actors seem to be rushing to be the first to cross the Rubicon. And if they do reach the other side—as now seems likely—it is difficult to escape the fear that the constitution should have been the birth certificate of a new Egyptian republic will be its obituary instead.